Bobby Cox was born in London, England, but has lived in Johannesburg, South Africa, and Adelaide, South Australia. She settled in Secret Cove on the Sunshine Coast, British Columbia in May 2004. After a career in education and publishing she turned to her abiding interest, painting, and has studied at The Slade in London and the Central School of Art in Adelaide, besides joining painting workshops. She takes as many opportunities as possible to paint with other practising artists. She was a member of the Royal Society of Art, Adelaide: of the Pastel Society of South Australia and of the Adelaide Art Society. She has exhibited in Adelaide both with the Royal Society and with other Art societies. On the Sunshine Coast in Western Canada, she has joined the Gibsons School of the Arts and the Sunshine Coast Arts Council. 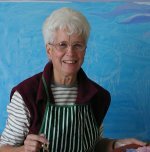 She also paints with the Sans Soucie Artists and the Pender Harbour Group. She has exhibited in the Sechelt Art Centre, and the Pender Harbour Gallery. Bobby has traveled extensively throughout the world so the stimulus has been constantly present to view her surroundings through fresh eyes. The different light to be found in the different countries has been a constant source of fascination in her painting. She has also had the experience of seeing many great works of art in national galleries throughout the world and seeing continents through the eyes of its artists. Among contemporary artists one of the greatest influences on her work has been David Hockney.